We love homemade chili especially when we’re entertaining. 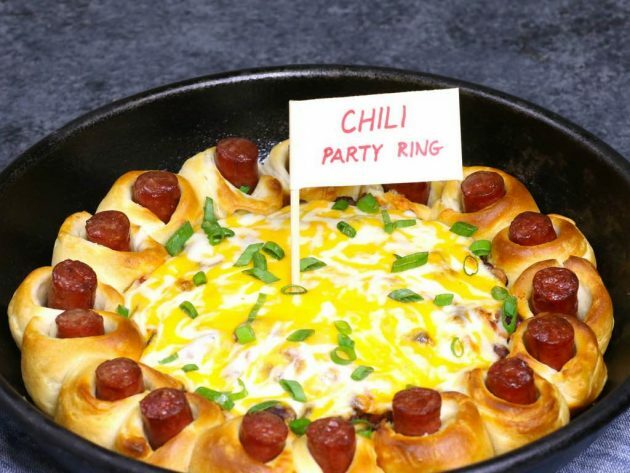 So we created this amazing Chili Party Ring with thanks to Hunt’s Tomatoes and BUSH’s Chili Beans for teaming up to sponsor this recipe. Plus video tutorial! 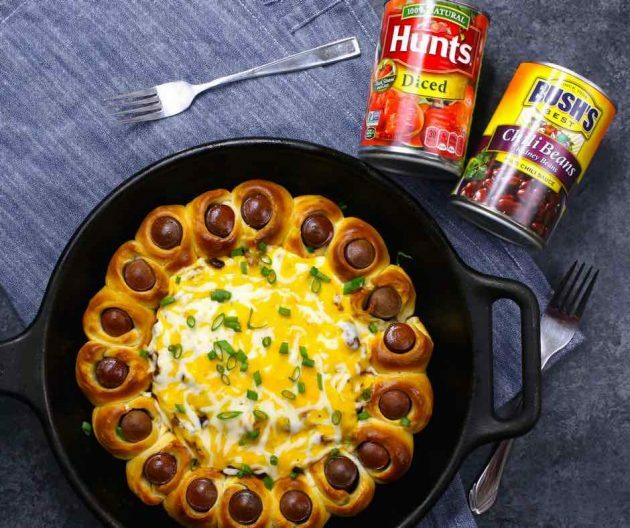 We’re wanted to show our Chili Pride with this chili dog skillet ring. 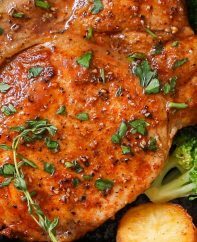 It makes an awesome weeknight dinner that both adults and kids love. 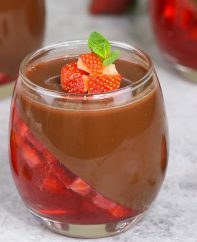 Or you can show off your hospitality and serve it for your next party. If you’ve ever wondered about chili addiction, look no further! We’ve served it on game day and watched while our guests devoured it in minutes. 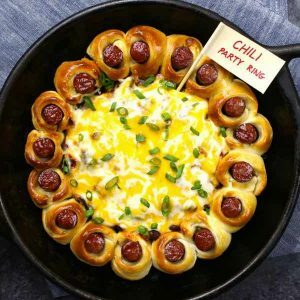 There’s something epic about mouthwatering chili flavors, cheese pulls and biscuit pull aparts. No one can resist! We’ve even made two for larger crowds. If you don’t have an ovenproof skillet, just use a round cake pan instead. 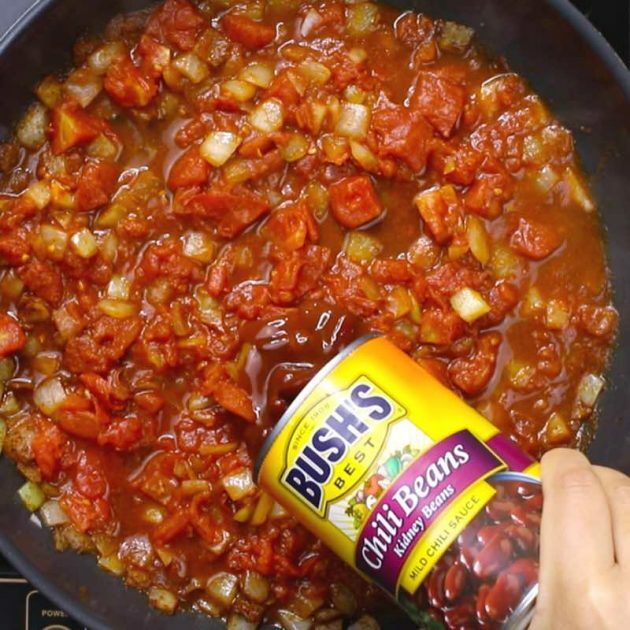 Often we think of chili as being the quintessential slow-cooker, but this recipe takes less than 30 minutes thanks to Hunt’s Tomatoes and BUSH’s Chili Beans. The best chili is not too complicated and starts with vine-ripened tomatoes and slow-simmered chili beans. 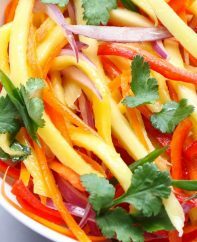 After that, all you need is some onions, seasonings and garnishes to make it a success. 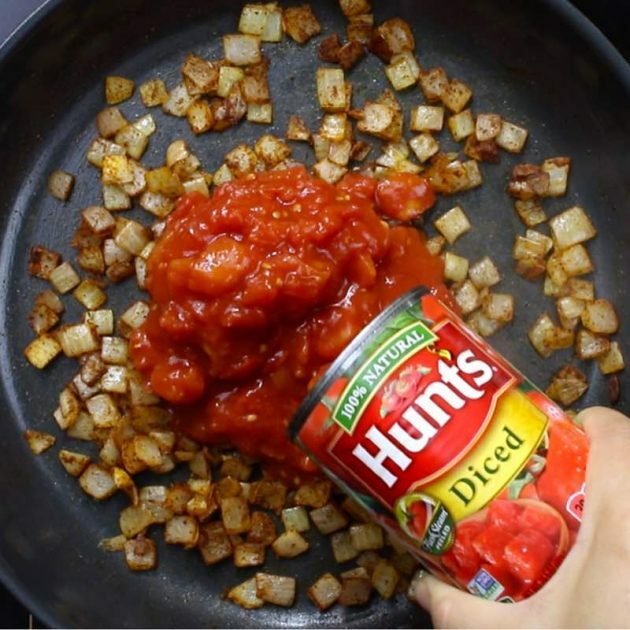 Hunt’s Tomatoes are vine-ripened and diced, with BUSH’s Chili Beans coming cooked and seasoned. 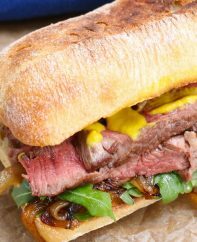 We added one 14-oz can of each for this dish, and it comes out perfect! We love that Hunt’s tomatoes are vine-ripened in California, and BUSH’s beans has been a family-owned business for over 100 years in Tennessee. The quality really comes through in the flavors. 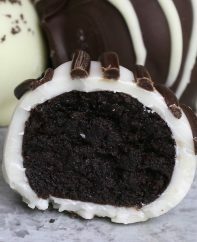 There are two parts to make this dish. 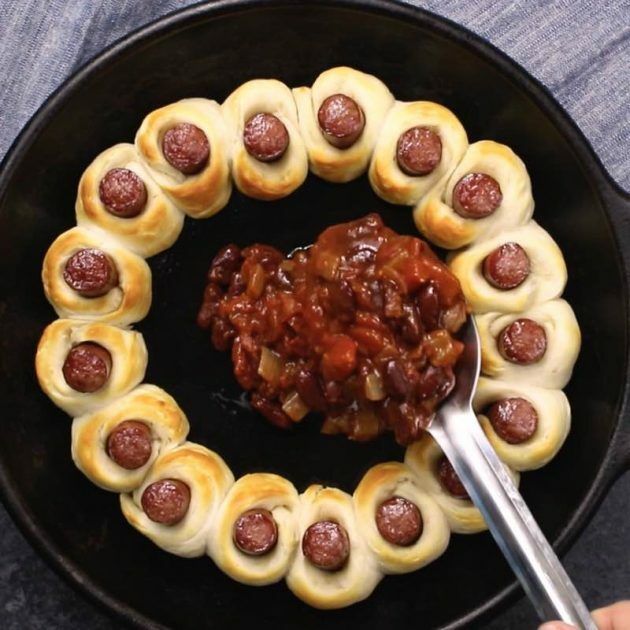 First, you use biscuit dough and hot dogs to make the ring in a skillet. Then while it’s baking, make the chili in a medium size pot or skillet. 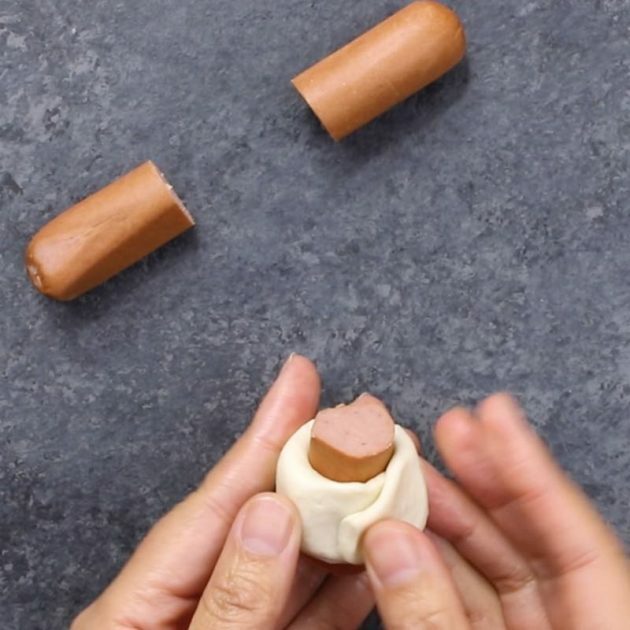 To make the ring, cut hot dogs (or veggie dogs to go vegetarian) into 1 ½” pieces. 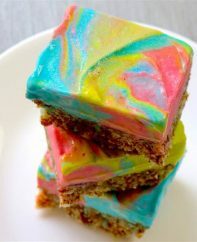 Then tear pieces of biscuit dough in half and stretch them into a rectangular shape to wrap around each piece of hot dog. Arrange them in an ovenproof skillet or pan to bake for 10-12 minutes. During this time, you can make the chili. Finally add the BUSH’s Chili Beans. There’s no need to drain the beans because you want the flavor from the sauce. Let it bubble away for about 10 minutes, stirring every minute or two to prevent sticking on the bottom. It should be thickening somewhat and looking like chili. Once the ring is golden, remove it from the oven. Then spoon the chili into the middle. 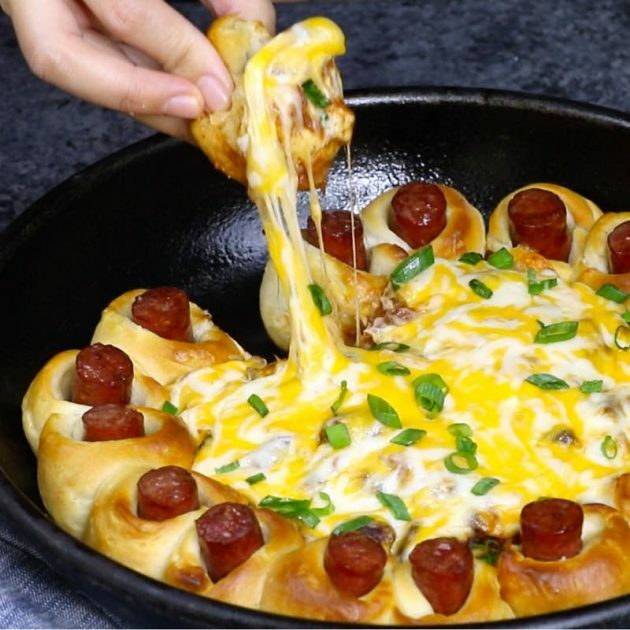 Sprinkle the cheese on top and bake for 10 minutes more. That’s it! You can serve it right out of the pan as pull-aparts, or serve it onto small plates. 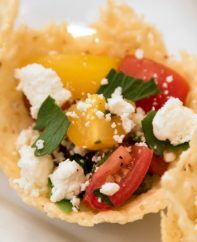 You’ll love the delicious flavors and cheese pulls. So good! Preheat oven to 400°F. 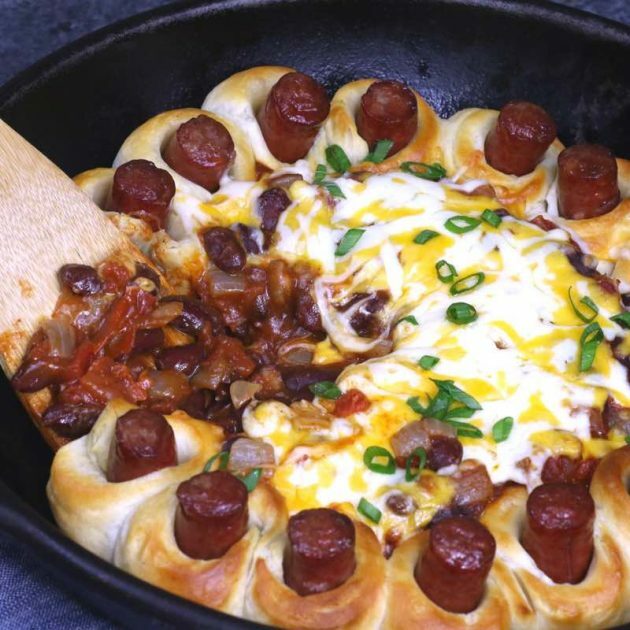 Set aside a large ovenproof skillet or round 9” pan. Slice hot dogs or sausages into 1 ½” long pieces. Open package of biscuit dough and tear each biscuit in half. Roll and flatten each piece of dough into roughly 2x1” pieces. Wrap one piece of dough around each piece of meat. 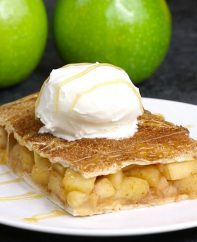 Arrange in a circle in the skillet and bake for 10-12 minutes until golden. Place a medium saucepan or skillet over medium heat, and add olive oil. Add diced onion and fry several minutes until translucent. Add chili powder, cumin, tomatoes, beans, salt and pepper. Simmer for 10 minutes until thickened, stirring every few minutes. 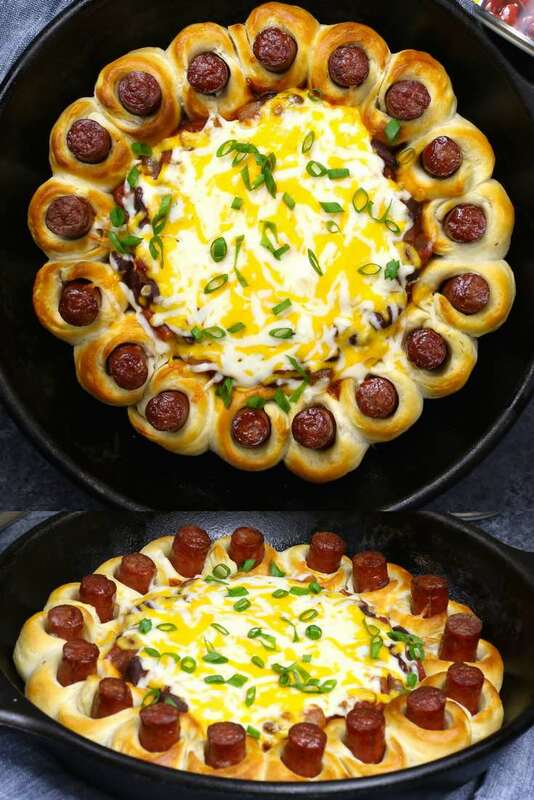 Add chili to middle of the party ring, and sprinkle cheese on top. Return to oven for 6-8 minutes until cheese is melted. 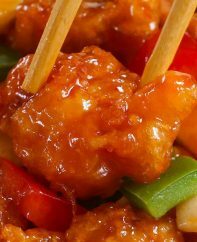 Sprinkle with optional green onion. Serve and enjoy!